As with many things, there’s a lot more to mounting trailer axle springs than first meets the eye. Here are 2 tips to make your trailer frame stronger. Once you’ve placed the axle properly, it’s time to mount it. There are many suspension options available, yet leaf springs are still the most common, and arguably least expensive. They are the workhorse of trailer suspension, but they are often hung wrong. Is “Wrong” too strong? OK, “Improperly” or “Less Than Perfect” are better descriptions. But, if they work, how is it wrong? Let’s talk about 2 things that are super easy to implement while building a trailer to improve the interface with trailer axle springs. First some background. When loading a trailer, a ‘stress‘ is created within the supporting beams. If the stress is below the material limits, the beams hold just fine. If the stress becomes greater than the material limits, then the beam will bend or break. That’s failure. Failures (breaks or bends) usually start at stress concentration points — where stress becomes high in a small location. Figure 2 shows an axle mounted under a main frame beam. Wheels, tires and crossmembers are removed for clarity. Figure 2 Stress Concentrations In Typical Trailer Axle Leaf Spring Mounting. In Figure 2, you can see some stress concentrations that appear as smallish red areas. Other stresses around them (indicated by greens and blues) are not as high, but because of the construction, there is concentration of stress in areas adjacent to the spring mounts. The back mount shows more because of the angle of the pivoting spring shackle. That’s normal. Side note: Figure 2 is a static, vertical load analysis. Dynamics like bumps or braking add stress, and change the look some. This stress distribution is typical of leaf type trailer axle springs. Values change and beam sizes change, yet distribution is pretty similar. Notice how stress in the main beam is higher on the top and bottom of the beam (as compared to the center side areas). Combine these ideas of stress distribution with the fact that welding weakens the areas immediately around the weld. (I won’t go into the heat distress of welding.) If we weld in areas of high stress, we effectively decrease strength of the beam. Can we avoid that? Yes. TIP 1: Do not weld on the bottom face of a main beam in areas of high stress. OK, so how do you weld on the spring mounts? Easy, weld the brackets on both sides – only. Don’t weld across the main beam bottom face. Another key to strengthening a trailer frame is reducing or eliminating the stress concentrations. Failures almost always start in areas of stress concentration, so if we get rid of them (or minimize them), the frame is stronger. The Trailer Plans from and Mechanical Elements have always had a buffer piece between the main frame member and the spring mounts. Customers ask about it, so here is a graphical engineering analysis showing why. Now let’s insert a buffer piece between the spring mount and the main frame beam as in Figure 4. Just that one strip placed between the brackets and the frame changes the stress. Note there are no red areas on the main beam, and only small amounts on the inserted buffer piece. We don’t care much about stress in the buffer because it’s there to take the stress and protect the main beam. Figure 4 Same Loading As In Figure 2 Above, But With A Buffer Piece Between The Spring Mounts And The Main Frame Beam. This trick can be done with a strip of steel like in this example, or with one leg of angle iron or with something more substantial. The point is stress in the main beam spreads. We depend on the main beam to support loads on the trailer, so if we can reduce the highest stress on that main beam, then we have strengthened the whole trailer. Tip 2: Add a buffer between the main beam and the high load points. Make the buffer piece at least as thick as the spring mount bracket material. 1/4″ is shown here. Extend the buffer beyond the spring mount — more the better — but there is a diminishing return. We find 5 or 6 inches out both sides from the bracket works wonders. Finally, weld the buffer piece to the main frame beams in stitches only along the sides — not on the ends. Short, spaced welds (stitches) are great. Two other ways to spread the stress include your choice of trailer main beam material, and the length of the springs. 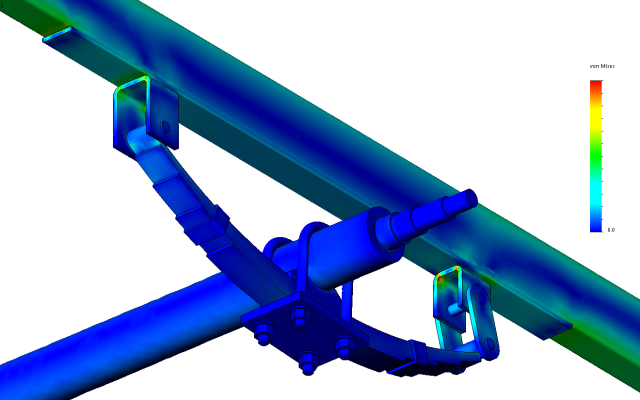 The buffering trick above to spread stress of the trailer axle springs does more than just disperse stress concentrations near the brackets. These 2 images below show how it spreads stress all around the beam. It’s works because what you do on one side effects the others. If you weld and weaken one side, it weakens the full beam. Cut one side, and the others have to make up for it. Also, if you strengthen one side, it adds strength to the whole beam. 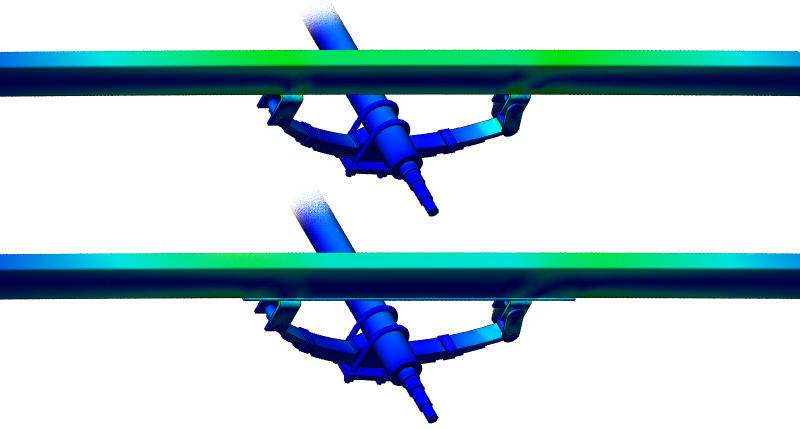 Beam Stress Comparison — The Beam Of Figure 2 (Upper), And The Bufferend Beam Of Figure 4 (Lower). Note the blues and greens in the two beams. Blues, and especially darker blues are lower stress. Now you know 2 great tips for making a better mount for trailer axle springs. 1. 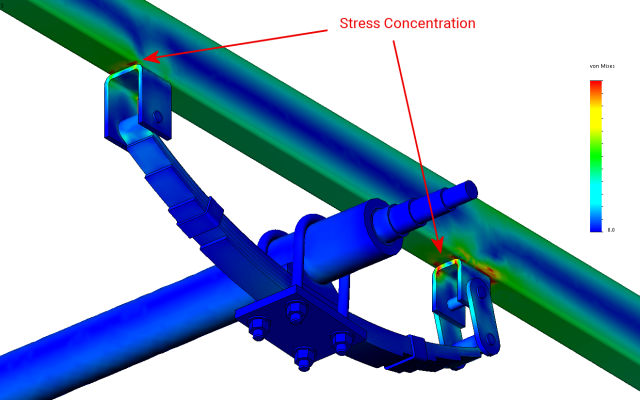 Don’t weld on the stress faces of a beam, and 2. add a stress buffer to spread concentrations. For a third tip, use longer leaf springs. The change is not as dramatic, but it’s in the right direction. How long should a trailer tongue be? Is there a standard or is it totally arbitrary? Let’s get some answers on this fun trailer tongue length topic. Why would you choose a long or short leaf spring for your trailer? They come in different sizes, not only for strength, but also in length. So, why do I want long ones or short ones? Does it even matter? So, I have this trailer, but it needs it to be bigger. Is it possible to make a trailer wider? Can I make it wider to carry more? IS THERE ANY VALID OR SAFETY REASON TO HAVE THE TRAILER AXLE ON TOP OF THE SPRING OR UNDER THE SPRING AS I HAVE SEEN THEM BOTH WAYS THANK YOU.